This book contains beautiful, eye-catching photos of India, the people, and the food; from fresh produce and spices to completed dishes. I’m a visual learner so I found the photography in this book remarkable. Just looking at the pictures transported me to India. I could almost smell the spices in my mind. But the recipes in this cookbook are the stars. 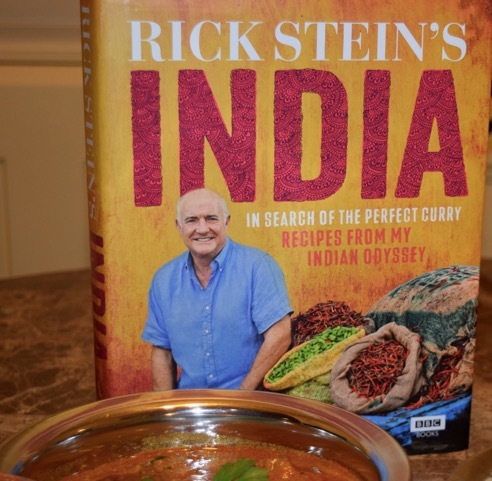 Stein has filled the pages with entertaining stories of his adventures through India finding different styles and flavors of curry. My absolute favorite recipe is on page 258, Lamb Rogan Josh, which Stein explains, “…comes originally from Persia where rogan means ‘oil’ and josh means ‘hot.’” Instead of using lamb I used beef; chuck eye roast to be specific. This curry is absolutely lovely. It has a medium heat that sort of catches you by surprise. And the flavor from the spices unfold as you eat it, warming your soul. This is a great dish for a cold winter night. The first time I made this curry I chopped and measured all of the ingredients before I started cooking. This recipe has twenty-two ingredients, and twelve of them are spices. That’s a lot of bowls! After going through the cooking instructions I decided it was better to use one bowl for the whole ingredients (except the toasted fennel seeds) and one bowl for the ground ingredients. Also, because Stein uses metric units of measure in his ingredient lists, you’ll have to convert those ingredients to U.S. customary units. I’ve converted the measurements for you in the recipe below. One last top tip! Cook the curry a day or two ahead and let it hang out in the refrigerator. 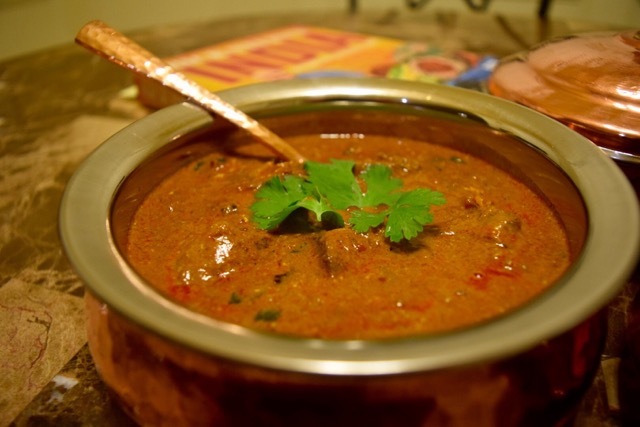 The curry will develop an even warmer, deeper, and richer flavor while it sits in the fridge. Enjoy! Toast the fennel seeds in a small frying pan until fragrant (remember to reserved 1/4 teaspoon for the finish). Heat the ghee in a large, heavy bottomed pot, like a Dutch oven, over medium heat. Add the whole spices and fry them for about a minute. Add the onion and continue to cook it over medium heat for about 10 minutes, until they are translucent and soft. Add the garlic and ginger and stir for about a minute and then add the ground spices (remember to reserve the extra garam masala for the finish). Stir for about 30 seconds. Add the tomato paste, beef, and salt and stir it around to be sure the meat is coated all over with the spice and onion mixture. Pour in the water and bring it to a simmer. Cover, reduce the heat to low and simmer for 1 hour. Once you’re sure the meat is tender and cooked through, take it off heat and add the yogurt, cream, and reserved fennel seeds and garam masala. Serve over steamed basmati rice, with fresh cilantro leave scattered on top.